i work at night. I was wondering if this could be done at another time or what is the best time. You work at night 7 days a week? Sunday is a day for success! Days of the week are an enhancement. Work when you need to. I would like to try Miss Robin's spell but would like to know how you would anoint your money if playing online games. Online you use credit cards or debit cards. Is there an alternative for online play? I would like to try Miss Robin's money spell, but don't know how I would be able to use the anointed money since I will do online games. Is there an alternative? You could take a very small dab of oil and rub it into your fingers and touch your computer screen in the four corners. Then rub a red felt cloth across your hands and rub the cloth on your screen. I watch folks at casinos rub the screen of machines all the time, and I have to say it appears to work. 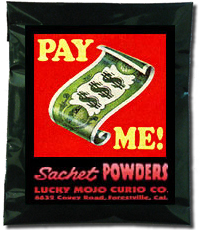 It would not hurt to blow the sachet powders from your hand onto the cloth as well. Write you credit card number on two pieces of brown paper bag seven times then 'win & pay' across your credit card numbers in a criss cross pattern. 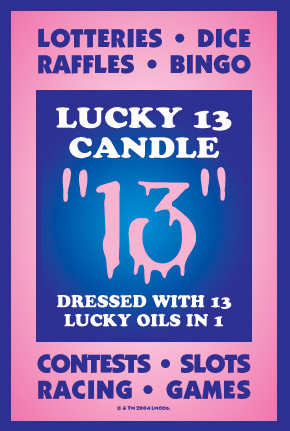 Fold the paper toward you and place one paper under the Lady Luck and one paper under Lucky 13 candles. Thanks a bunch Flora those are g-r-e-a-t ideas. I really appreciate your help. I hope that one day I will be able to contribute to this forum, and help you personally. May God bless you and give you more wisdom to share with the rest of us. I have one question though. Can you please let me know what red felt is. Thanks again for everything. Red Felt is cloth. Luck Mojo sells a red felt bag for making mojo bags. You could use one of those or find a small piece of it at a local material /fabrics shop. My grandmother use to take old flannel pajama pants and use that for rubbing magic into stuff. You try that. You will want some soft cloth that will not leave tiny scratches on your screen. Red is associated with life blood, luck and power that is why I suggested it. I think you may mean red flannel - felt is much thicker. No I mean felt like wool felt but I gave the example of my grandma because she had little to work with at times. The locals here use a thick strip of cloth to rub on the electronic computer screens to keep the oil from going all the way through the cloth so it does not mess up their screen over time. When I have asked to see their cloth it is felt most of the time. Don't use craft felt it is full of glue to make it easy to cut. A good fabric store sales clerk will know exactly what I am talking about. It is a type of felt that can be used to sew purses and wallets without wearing out quickly. It can be wool or cotton. I suggest wool. Let us know how it works for you online. I have done the spell and gone to the casino, and won on the first machine I touched! So, I know the spell works well as it was written by Robin. I wish you lots of luck in gambling! Where can I find Miss Robin's Gambling spell? 1. can this spell be used for the lottery? 2. Must the vigil candles burn completely out once I light them? or can I put them out and light them again when I want to do the spell again? Your chances of winning a lottery jackpot are a lot less than winning at a casino. You can play games with better odds, and of course there are smaller prizes in every lottery game. However, if you have a gambling addiction that is so severe that you had to bar yourself from casinos, you are better off doing work toward getting a better job (Steady Work and Crown of Success) or attracting money (Money Drawing, Wealthy Way, or Prosperity). The answers to your questions are yes it can be used for lottery, and you can pinch or snuff out the candle and light it again. Thank you for your response. I am not trying to win the jackpot. I read somewhere here that win playing the lottery I should try playing to win smaller prizes like the pick 3. I am receiving disability benefits and I am not able to seek employment so those other spells would not work for me. Again I thank you for your advice and answers. Hi, I would like to try miss Robin gambling spell but do not have the time to order the encased candles. I have all the oils though. Does anyone know if I can just use regular candles that are not in the jar, and if so what color or colors would I use. Thanking everyone for all their help. 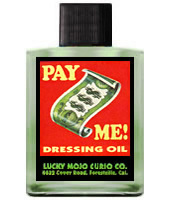 By your restricting yourself to the use of oils only and stripping out the preliminary bath and the dressing of your body and the money with the powders, you are leaving out the most important aspect of the work, namely, the creation of a magical link between you and your money. A spell like this is not just dabbing on an oil; it is a carefully delineated work of magical art. Additionally, by substituting your own candles, you are leaving out the candles which we have fixed and prepared with herbs and oils and prayed over for you, so you are not availing yourself of our helpful spiritual contribution to your case. Go ahead and try to do the spell with no bath, no powders, and no prepared vigil lights (the Lady Luck candle is green, and the Lucky 13 candle is white, since you asked), but understand that you are just sketching here with chalk on a blackboard, whereas Ms. Robin's spell is a truly museum-worthy masterpiece of the conjurer's art. Thank you Catherine for helping me to understand all that is involved in the spell. I do have all the other ingredients that is needed but I just forgot to mention that in my post. However, I do understand how important getting the right candle is. I however, want to do it right so I will be patient and order the candles that are needed from Lucky Mojo of course. I am very thankful Cat for you and all the other members who have shared their knowledge with me. I have shared what I have learned with others and told them to order products from Lucky Mojo. I cannot imagine myself ordering from another company. Thanks again Cat. 1) Should you take a shower before you go to gamble? 2) Do you let the candle continue to burn after you take the money to go gamble, or do you let it burn while you are at the casino? 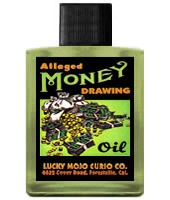 3) How do you anoint money, and how do you put the powder on? I have read this spell for a long time but never had the courage to try it, I will be trying it this weekend so I want to be sure I understand. I believe the only person who is qualified to answer this would be Miss Robin, herself. We can offer general suggestions for the traditional way to do these things, but not in regards to her spell specifically. There may be certain ways of doing it per her directions. I recently purchased all the supplies for Ms Robin's spell. I plan to try my chance at bingo this week. Question is I have several raffle tickets from different sources for major prizes. Any suggestions on how to incorporate these tickets into Ms. Robin's spell? If not, whats a better alternative? The winning announcements for the raffles vary from a couple of weeks to a few months so I have plenty of time. I also have the fast spell kit that I haven't used yet. Do I combine all the raffle tickets under one candle..? or separate them individually according to raffle name? Any suggestions would be greatly appreciated. QematetSau wrote: Lucky 13 candle; Lady Luck candle and oil; and, pay me oil and powder: I used these based on the gambling spell by Robin. It worked really, really well when I went to the casino. I found on the first slot machine I used. QematetSau, Can either you or one of the moderators please post the above referenced gambling spell in this thread? It can be quite tedious to sift through the thousands of posts here on the forum in search of a particular item. Thank you and blessings! Help with Ms Robin's Lucky Gambling Spell. 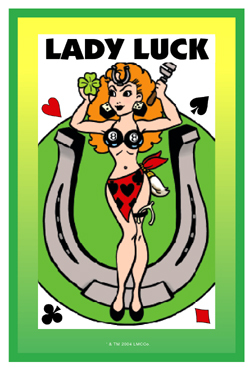 So now i will split your request off from customer testimonial thread, where it is off-topic, and join it into Ms Robin's gambling spell thread, where you can read a lot more on the subject, in addition to what's on the HITAP web page. Thank you very much for that, angelael. I searched for Robin's Gambling Spell in a search engine and it brought up the LM page immediately. I had no idea it was so hard for some folks to find. I just would like to ask if it is possible to do Ms. Robin's gambling spell for bingo around the same time that I can do the Fiery Wall of Protection spell kit? Is there a Psalm or a prayer we say while we do the bath? Just wanted to let you know that I will start this bath and just say any prayer with it then. Well the plans that I had to go play Bingo got cancelled so I think I will use the money that I anointed for this spell to go play the lottery because I already used the bath crystals and I don't want it to be a waste. I was thinking about possible going to play Bingo alone but I do not want to look like a weirdo. So can I use the cash that I anointed under the candles to play lottery and scratch tickets then? And would it be alright if I go buy lottery tickets in a couple of days rather than "the next day'? I always pray the Psalm 23 for love, luck, and money. But, I am not an expert on the Psalms (Miss Michaele is). Good luck!! And win a bunch! Alright Thank You, and would it be alright if I also make an attempt to go to the Bingo hall on another day seeing that I did all of the work for this on Tuesday but got stood up by the people that I know? So will it be alright if I go play bingo on another day rather than the next day after I do all of the work for this? The spell ought to be still energized. But no guarantees! Well I've thought about what you said regarding 'no guarantees' on the work done is for one game only and I've decided to re-start the work for Bingo on Sunday so that I could go play Bingo on Monday afternoon. I will be playing by myself and I don't care if I look like some weirdo. I will prepare this work and go throw it over my left shoulder towards the west on Sunday evening. If I end up looking like a weirdo because I am playing alone, it is because I got stood up by my 'friends' so I don't care. If they talk bad about you and you win, you can cry about it all the way to the bank!! Thank you, much love to you all. I prefer the bath if I only have one choice. But, I think that doing both would greatly increase your chances. Well I made an attempt today to go to the Bingo Hall but when I left this morning head over there I actually got lost. Probably because in this lame part of town nobody puts up any numbers on buildings so I just came home and planned out the correct route to drive there tommorrow and then I re-did the bathing with the PayMe salts again. This is very draining but I at least I feel recharged after the bath and dumping the used bath water towards the west at the crossroads. I will just have to do this again tommorrow. I just wanted to let you all know that I went to play Bingo this morning after all of the work that I had done with this spell that nothing went well. I had brought the prepared money with me so that I could use that to purchase the strips but when I got there I found that if I wanted to get the book of strips with the electronic verifier that it would cost more than the cash that I had on me (the prepared cash that I brought) so I just paid for it by debit- meaning that I didn't use the cash that I had been praying over for days...and that with a combination of me just being exhausted and having tired eyes from driving in the sun was just feeding that fact that I was making bad decisions. I may try to do what was suggested on here to play the bingo online because I found it to be a little overwhelming in the bingo hall because you have to check the numbers on all of the sheets to play so it has to be done quickly although everyone there was very nice. I once had money prepared to buy lottery tickets and they couldn't take the bill because it was too big and they didn't have change So, I put it on my credit card. Bu, it was sad that I prepared the money for nothing! UGH!! So, your story is familiar to me! Why not try it gain? As for me, I gave it to a person doing a service for me. And he gave it back to me. Said the service was a gift. I then gave it to someone else and they, in turn, returned it to me. So, I inevitably just kept the money (an still have it in my bible)! Does anyone know if after taking a bath with the pay me crystals, do you have to throw the used water at crossroads? Or can you throw it anywhere outside? Also I know that you have to take a bath in the crystals but unfortunately I don't have a bath tub only a standing shower. Would I be able to just pour the bath water over my body? "Which way you throw the water depends on the purpose of the bath. If you are drawing stuff to you, then you throw to the East/rising sun. If you are getting rid of stuff, then you throw to the West/setting sun." On the page for Ms. Robin's spell she says after the Pay Me Bath throw it to the West. Devi is saying throw to the West for getting rid of and Ms. Robin is saying throw to the west for the pay me bath which is gaining. I'm sure one of them was just a typo but just want to check to be clear before I do the work. Which is it?